That’s right – you don’t have to bring water to a rolling boil to make it safe. This can be useful in emergency situations, when fuel is scarce, or in sensitive wilderness areas when fires are not permitted, or discouraged. Also water cools faster from 150 degrees than a boiling 212 degrees, making it drinkable in a shorter time. The WAPI also works particularly well with campfires, backpacking stoves or in conjunction with a solar cooker. Great for camping and emergencies. The Reusable WAPI – Water Pasteurization Indicator is small polycarbonate tube containing a wax that melts when water is heated enough to be pasteurized (65°C/149°F). 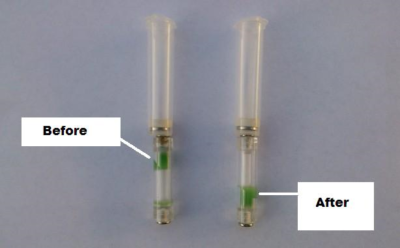 The wax changes to a liquid state and falls to the bottom of the tube, indicating that pasteurization temperature has been reached. The Sports WAPI is an extremely useful, pocket sized, reusable device that should be in every campers kit and every home emergency kit. The complete WAPI kit is 2 inches long and about the diameter of a pencil, and weighs about 7.5 grams. Disease-causing micro organisms in water are killed by exposure to heat in a process known as pasteurization. Water heated to 65 C (149 F) for a short period of time is free from microbes, including E. coli, Rotaviruses, Giardia and the Hepatitis A virus. (Milk and other Foods require 71 C (160 F) ). 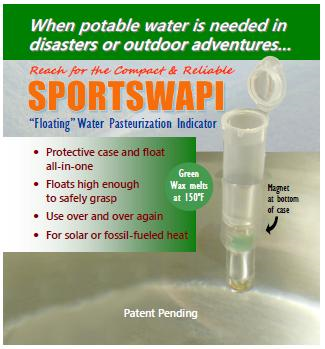 The WAPI provides you with an effective technique to assure safe drinking water without boiling. Not having to bring the water to a full boil – saves precious fuel, expense, resources, and time. The WAPI is small, non toxic and can be used with a variety of heat sources. The WAPI can pay for itself on fuel cost savings on your first trip. The WAPI also supports alternative methods like solar pasteurization of water. What heat temperatures are required for killing microbes and viruses in water ? 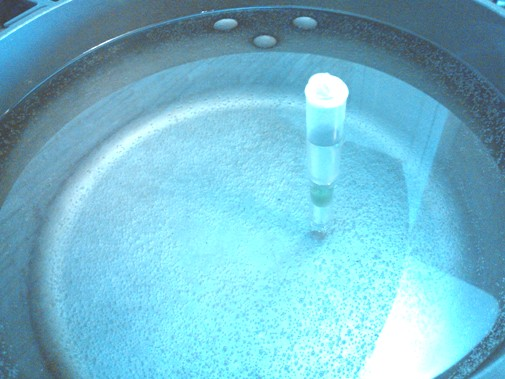 Put your WAPI in the water allowing it to float with the wax in the top poertion of the tube. 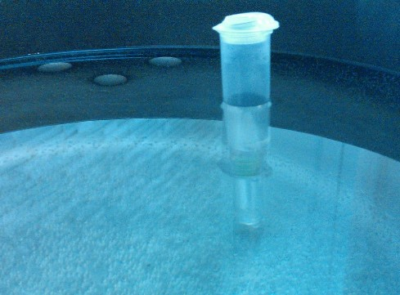 As the water heats the wax inside the WAPI will begin to melt and fall to the bottom of the tube. After 5 minutes the water is pasteurized and safe to drink. Let WAPI cool in a vertical position, this will solidify wax at one end. To reuse, flip it over and it is ready for use. Can be reused over and over again. Slide Wapi into Pot using the washer and string to orient WAX in the UP position. Make sure WAPI is in the deepest part of the CENTER of the pot, not touching sides – use extra line if necessary. Put Pot in your Solar Reflective Cooker as you would for standard solar cooking (facing Easterly in the AM and West in the PM) – reorient as needed for maximum solar rays. When the WAPI Wax melts and falls to the bottom of the indicator, pasteurization temperature (65°C/149°F) has been obtained. Even if the water has re-cooled – if the indicator has fallen to the bottom, pasteurization has occurred. To reuse, let WAPI cool in a vertical position, this will solidify wax at one end. To use it again, flip it over and it is ready for use. Can be reused over and over again. Be sure to completely dry the WAPI between use and before storage. If moisture remains, the nickle plated screws may show signs of rust over time. While this does not impact performance or affect the water, it is unsightly. Over a prolonged period (years) the rust may eventually compromise the seal, meaning it is time to replace the WAPI.